I’ve been wanting to try out some LED lighting now for awhile – LEDs are every where in this hobby. 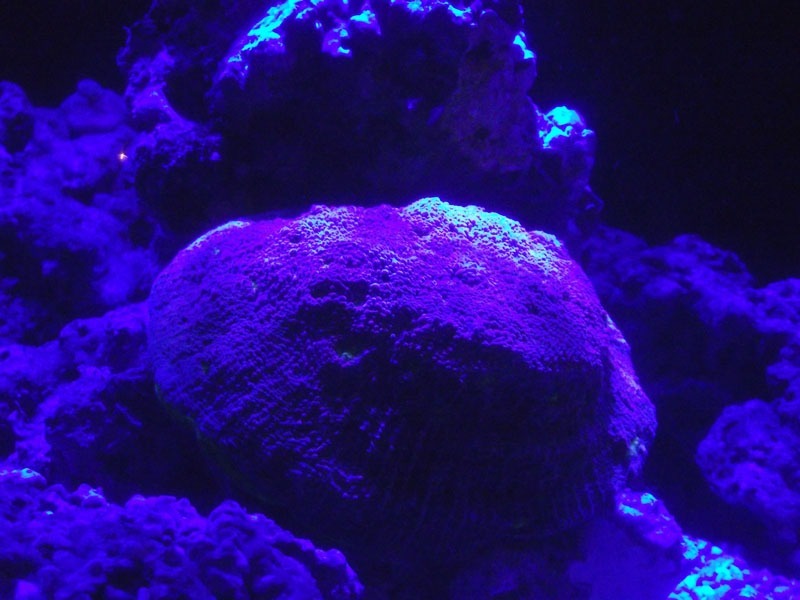 They’re suited to nanoreef applications where hobbyists need more light for light demanding corals but don’t want the heat associated with metal halides. 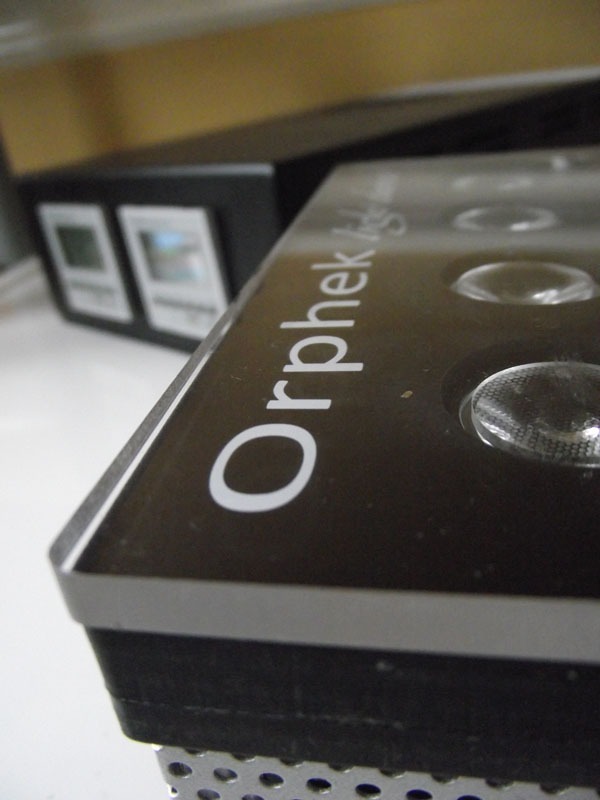 With so many LED options available now, I opted to try the Orphek PR-156W unit based on it’s claims to be a replacement for 250w/400w metal halides. The PR-156W unit differs to the more commonly available PR156 in that this version makes use of wider lenses, for better light spread. The light unit itself measures 607mm (24?) in length by 157mm (6?) wide and comes in at 50mm (2?) tall. 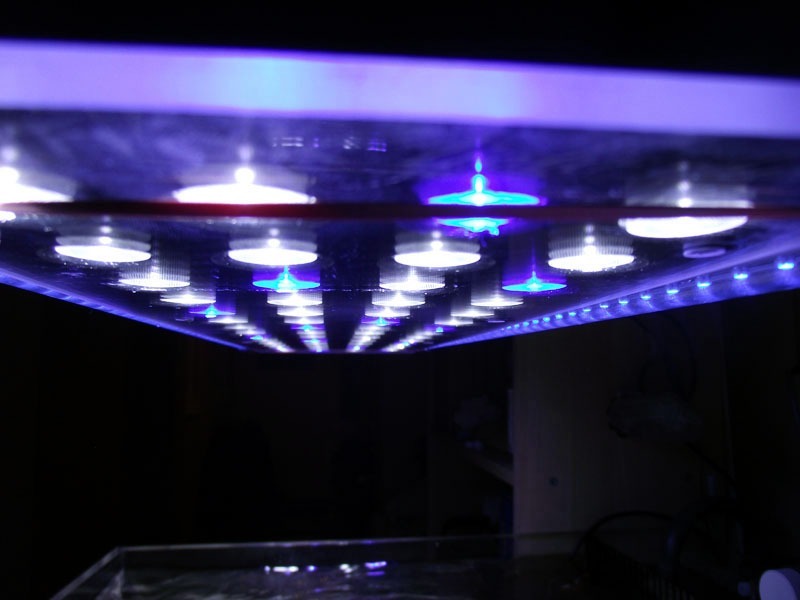 There are 60 LEDs in total running at 2w each giving the PR156W a total energy usage of 120w. 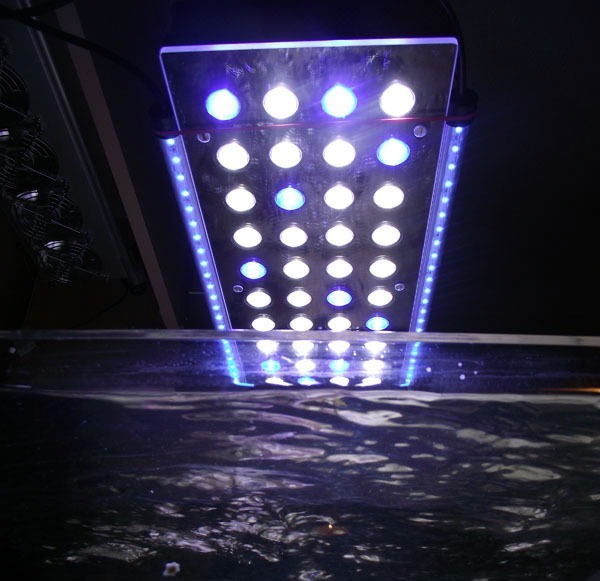 The LEDs are fitted with 120degree frosted lenses. 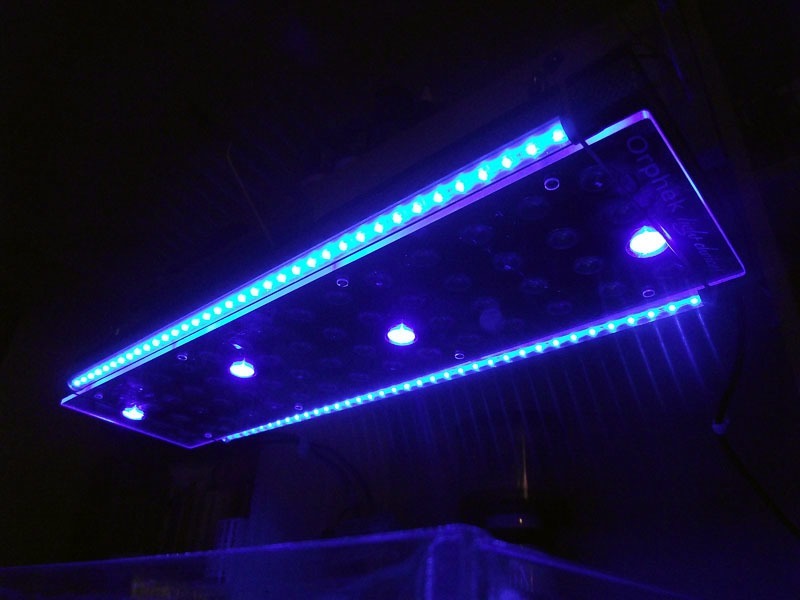 The white LEDs are rated at 16000K (160lm, CRI 88), while the blues cover the actinic spectrum (450nm – 460nm). When the box arrived I was surprised at how narrow the package was – and a little concerned by the length. After getting the packaging opened up, I find the LED unit itself and the timer box. The size of the timer box was something that took me by surprise – it was almost half the size of the 2ft lighting fixture. The instructions for the lighting unit and hanging kit were all packed together in a little plastic bag. All round the packaging was really good and nothing appeared damaged. The light unit has a unique style with the combination of metallic mesh combined with clear and black acrylic giving it a modern feel. I think the unit could have been given a little more time in the design department as the silver screws and hanging nodes that stick out the top just don’t seem to fit in completely with the overall design. It doesn’t look bad, just feels rushed. 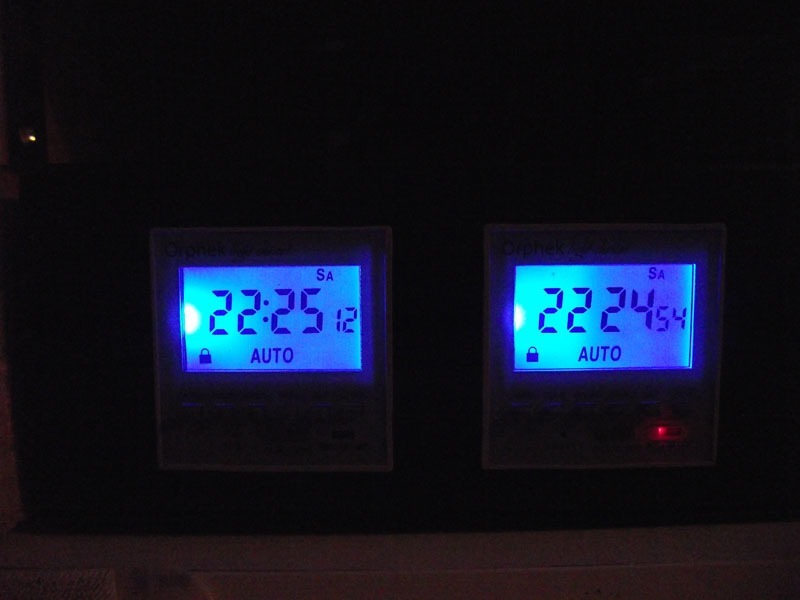 First thing I did was get the timer box plugged in and followed the instructions to get it running, not too difficult considering how small the buttons are on the timer. In terms of setting the timers – a fair bit of time had to be spent with the instructions. I got the hanging kit together to see how it all fitted together. The quality of of the hanging kit didn’t seem to be all that great, I didn’t like the idea of using hooks through a hole to attach the hanging kit to the unit. It really looks messy, almost too industrial. 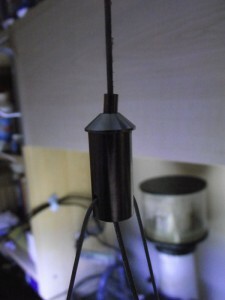 Once the hangers were attached I proceeded to get the light suspended over the ZEOnano9020. The catches on the hanging kit just wouldn’t stick, that quality concern I had earlier, is no very evident. A good 10-15minutes of trying to get the unit to hang, I finally got the hanging system to do it’s thing. Later adjustments of the lights height were met with the same frustration. 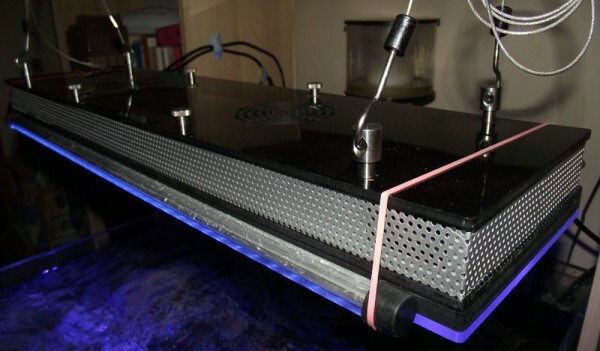 Getting sleep that night proved to be a stressful excercise as I had visions of the Orphek unit landing in the tank… The light has a single cable which connects via a secure multi-pin connection to another length of cable which goes to the timer box. From here there is a single power cable. The overall length of these cables was a little short in my opinion and would consider asking for a much longer cable if you’re housing the timer box a fair distance from the actual lighting unit or power source. Once everything was connected it was a case of getting the timers to do their thing, the simple on/off option was straightforward, setting up the actual timers – refer to the instructions provided and go from there. With everything in place, the PR156W was mounted roughly 14? above the water line, I hit the power button in anticipation. Blue lights first. Very impressive, lovely actinic light flooded the aquarium. 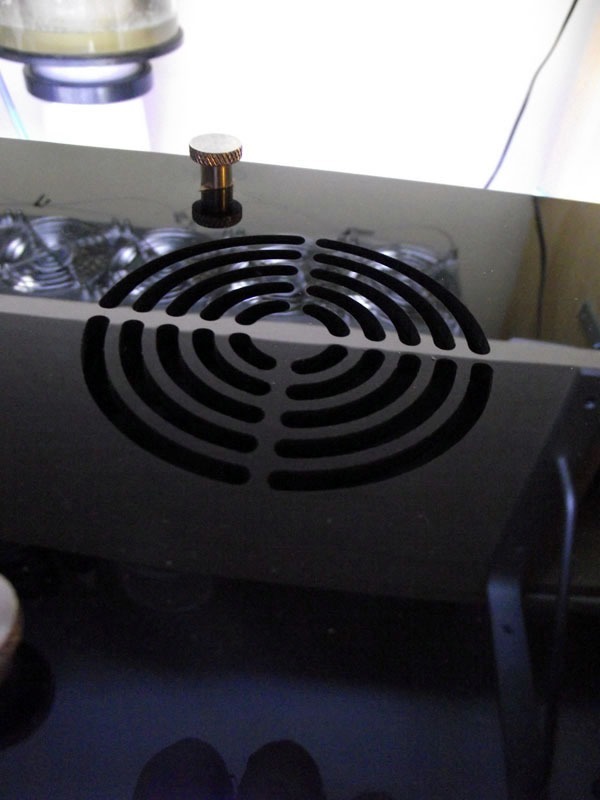 The light ‘hotspots’ directly below the LEDs was quite noticeable. And yes, we had shimmer and glitter lines galore. I hit the next power button to bring all the LEDs into play. How can I describe this? The tank was awash with a 12000k style colour. The overall light wasn’t extremely bright – but it did remind me of the snorkelling in the shallows of a reef. The glitter lines were all over the place – not wide natural lines, more like a mesh of lines across the bottom of the aquarium. After 10 minutes I came back to take a look at the tank. 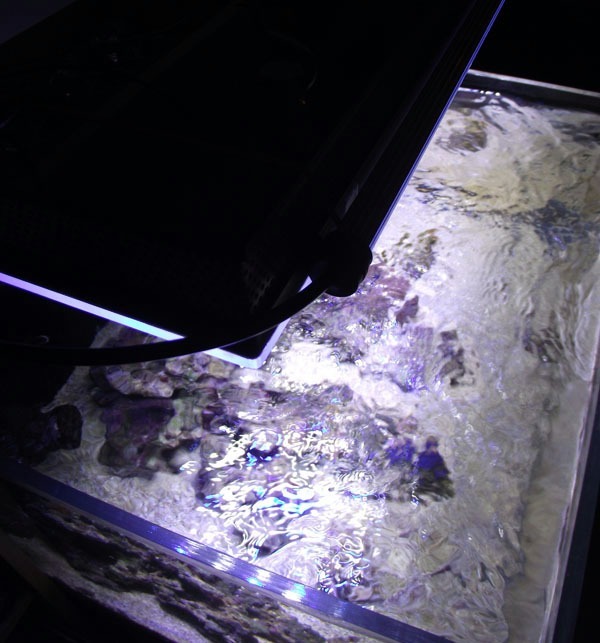 I could easily pick out the blue LEDs on the substrate and live rock – the light of all the LEDs hadn’t quite blended despite the use of the frosted 120degree lenses. 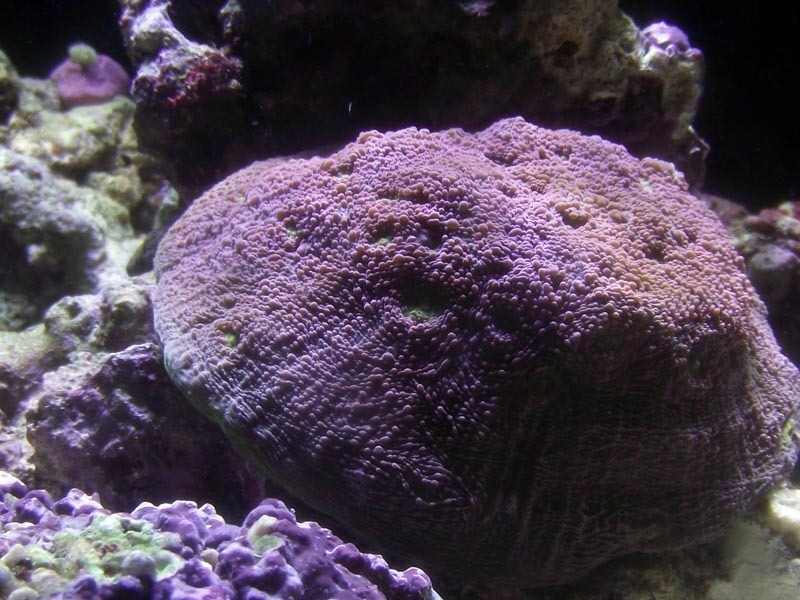 What I was left with was somewhat of a disco display dancing on the substrate. The colour rendition of the fish and corals in the tank was really impressive, this was something I was happy about. But when viewing the aquarium as a whole everything just looked very bland – there was nothing crisp or fresh. Taking photos under the LEDs was real change, colour correction etc wasn’t really needed. With the spotlight nature of LEDs I quickly noticed the shading. While the light was extremely bright under the unit, the light drop off was really severe as you moved away from the unit. My PAR measurements later confirmed this. Now again, I had this fixture hanging around 14? above the water line and it’s spread wasn’t what I had hoped for despite it’s wide angle lenses. 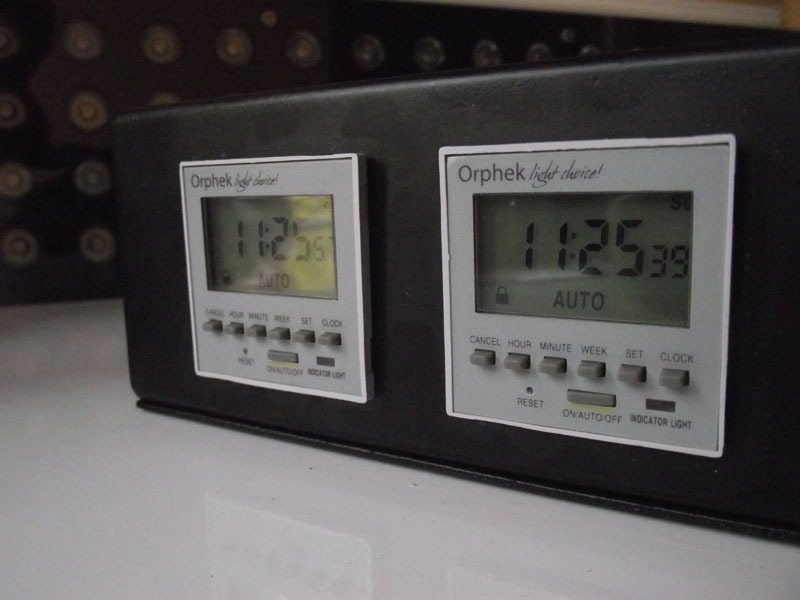 After running the Orphek PR156W for a few hours, I got out the PAR meter to do some testing. Please note, these are general results and are by no means 100% accurate or scientific, they’re simply my findings. As you can see the numbers aren’t bad for a lighting unit using only 120w of power. Also you could increase your PAR in tank by lowering the light, but then you sacrifce light spread. Even over the 24? x 20? 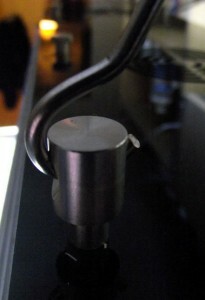 area of the ZEOnano9020, the useable light dropped dramitically once you moved away from the lighting unit’s footprint. At only 2? outside the lighting footprint, the PAR value was around 300 at the water surface.